Please note that the content of this book primarily consists of articles available from Wikipedia or other free sources online. 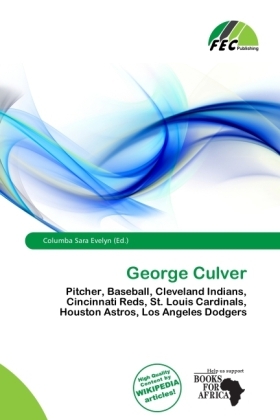 George Culver (born July 8, 1943 in Salinas, California) is a former professional baseball player who played pitcher in the major leagues from 1966-1974. Culver would play for the Cleveland Indians, Cincinnati Reds, St. Louis Cardinals, Houston Astros, Los Angeles Dodgers, and Philadelphia Phillies. He also pitched one season in Japan for the Nippon Ham Fighters in 1975. Culver pitched a no-hitter against the Phillies while pitching for the Reds on July 29, 1968.